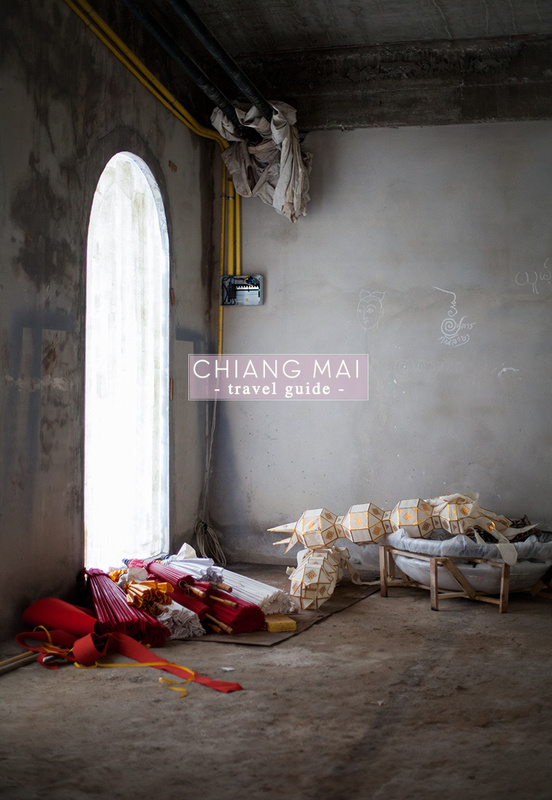 Chiang Mai, the jewel-like city of Northern Thailand, beckons new and repeat visitors alike. I was here as a kid with my dad and loved coming back. It's a charming city -- manageable in size, relaxed in pace, with delicious regional cuisine (lots of coconut, YUM!! ), elegant hotels, gorgeous temples and day hikes that will make your heart skip a beat. We were there in November visiting old friends . . . and we fell in love with the place. I photographed a story about it for Conde Nast Traveler too. 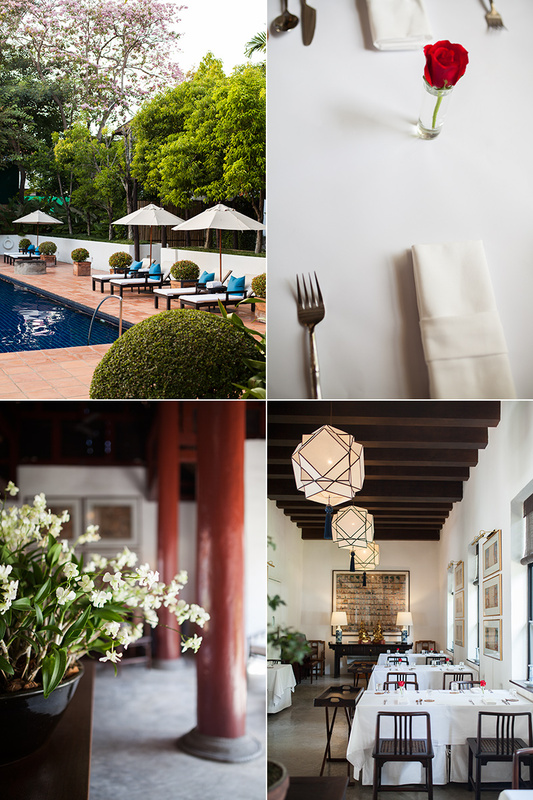 Here are my recommendations for where to stay, eat and hike. 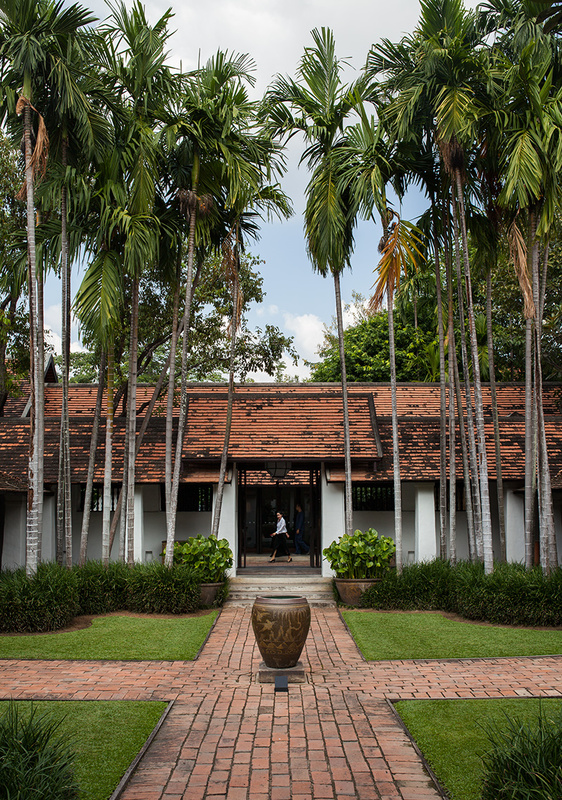 Hotel Ramachankha, is a small, luxury boutique hotel tucked away in the heart of the old city (and blocks away from the beautiful Wat Phra Singh temple). This place is elegant beyond compare. Courtyards and a breezy, indoor/outdoor architectural style allow guests to relax and enjoy the sunshine (and the pool), after a busy day of site seeing. The food is prepared with local ingredients, in a prefix menu or a la carte, all served al fresco in a tree-lined patio (often accompanied by live music), with red roses setting off bright blue and white porcelain dishes. 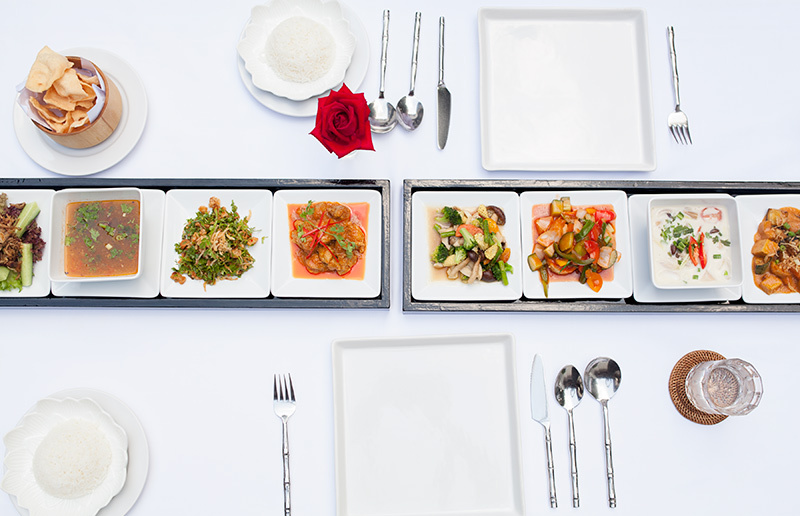 The chef's focus is on the regional cuisine of the Lanna people (Northern thai) and includes nearby Burmese and Shan cuisines as well. Dining at Huen Muan Jai is a must. This restaurant is Andy Ricker's recommended lunch joint -- and the man knows Northern Thai food, with several restaurants in this regional Northern Thai style in Portland, OR and NYC. Here families celebrate, friends gather and business people break up the day with little dishes that come tapas style, in smaller portions, so there are many tastes, dips and slurps in one meal. 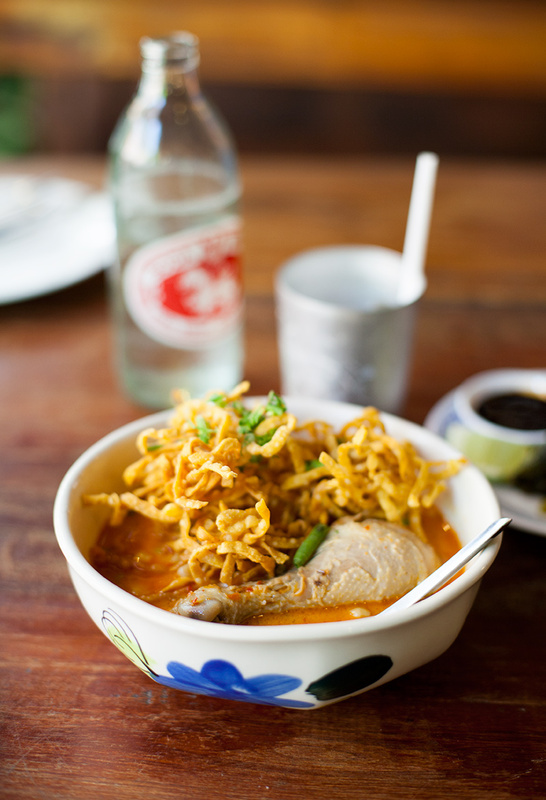 Highlights include charred eggplant spread, fried bamboo shoots stuffed with aromatic pork, chicken coconut soup with egg noodles -- all topped with lime, shallots and chilies. The menu is never-ending. We wanted to come back and try other items, but discovered the place on our last day in Chiang Mai. 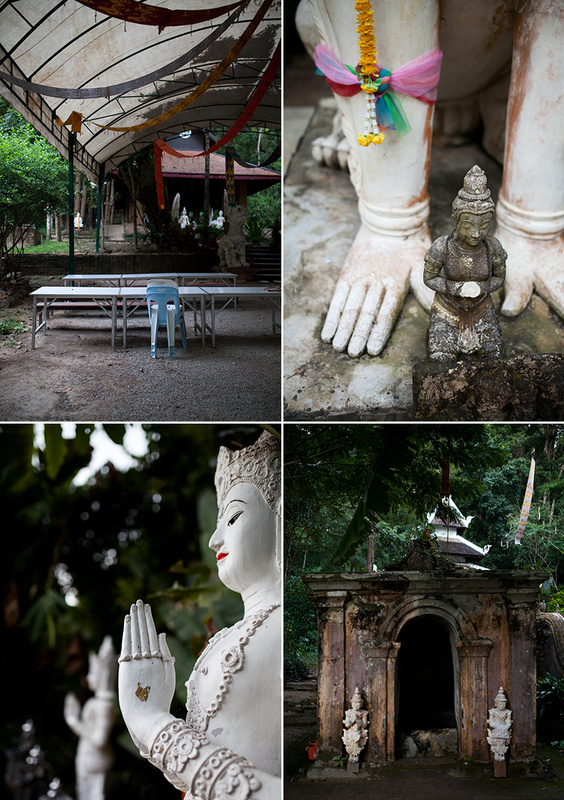 Hiking about 30 minutes through the forest to the Wat Palad temple complex is a sparkly, waking dream. 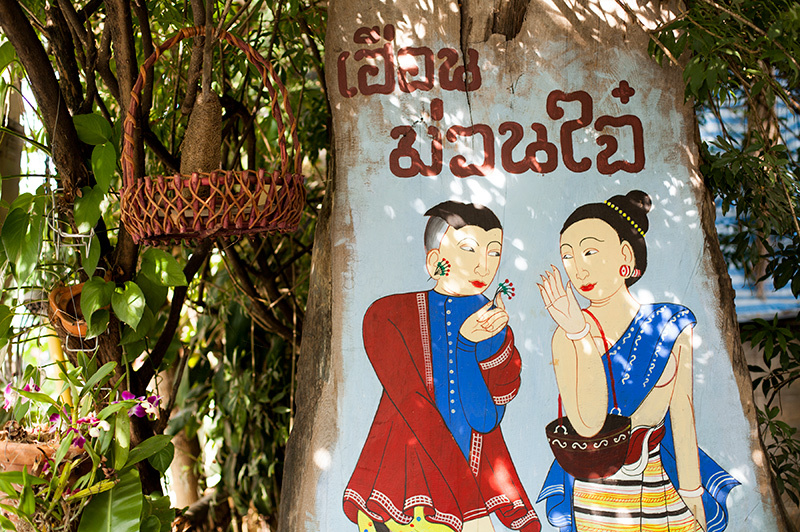 From the lush foliage, to the bejeweled buddhas and festooned bodhisattvas, and the sparkling stream one crosses on a wooden, jute rope bridge, the delights are endless. This temple was created in the forest, not around it. The connectedness of the people, the land and this sacred space is as thick as the leafy vines which envelope it. 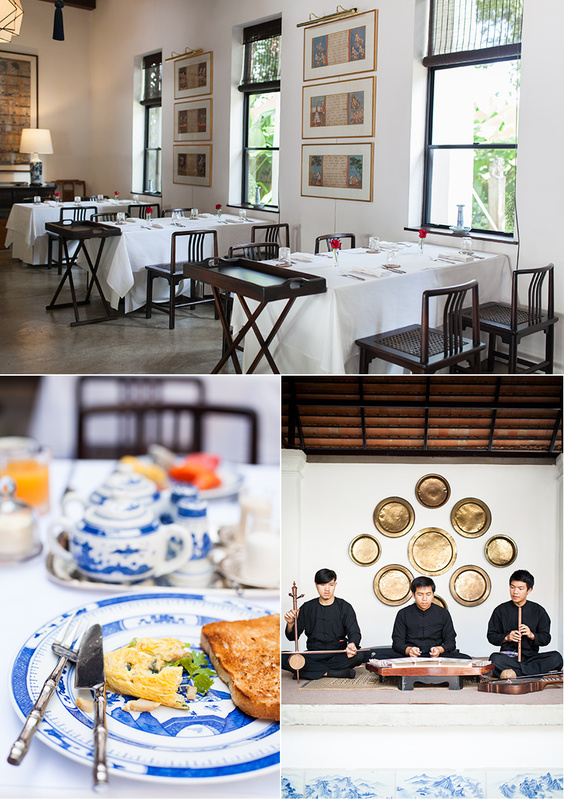 Thai Cookery Centre, with its young, delightful staff leads small groups in totally hands on classes. You get your hands positively smelly with garlic, ginger and kaffir lime leaves (a good problem to have in my book), rub shoulders with travelers from all over the world and learn to make the most extraordinary coconut curries. Enjoy a half day or day with the lively team at Thai Kitchen Cookery Centre, located in an enclosed, outdoor kitchen in the old city. Participants also go to the neighborhood produce market to procure all that's needed for the cooking. 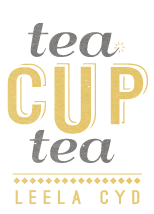 Questions of the vendors and curious minds are highly encouraged, prepare to learn a lot about food, culture and traditions. 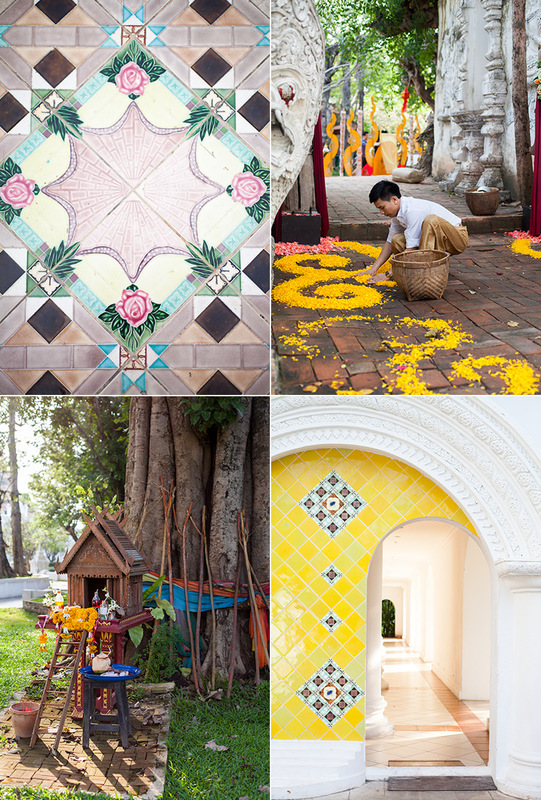 The Dhara Dhevi is a spectacular hotel and spa, built with the architectural influences of historic Lanna culture. There is an assortment of textures, styles and ideas here all working in harmony to feel as if you are royalty from another time, it's almost an impossible conglomeration of architecture -- but it works! It casts a spell of relaxation upon anyone who enters the highly guarded gates. The hotel is located on the outskirts of town and has a luxurious spa program. 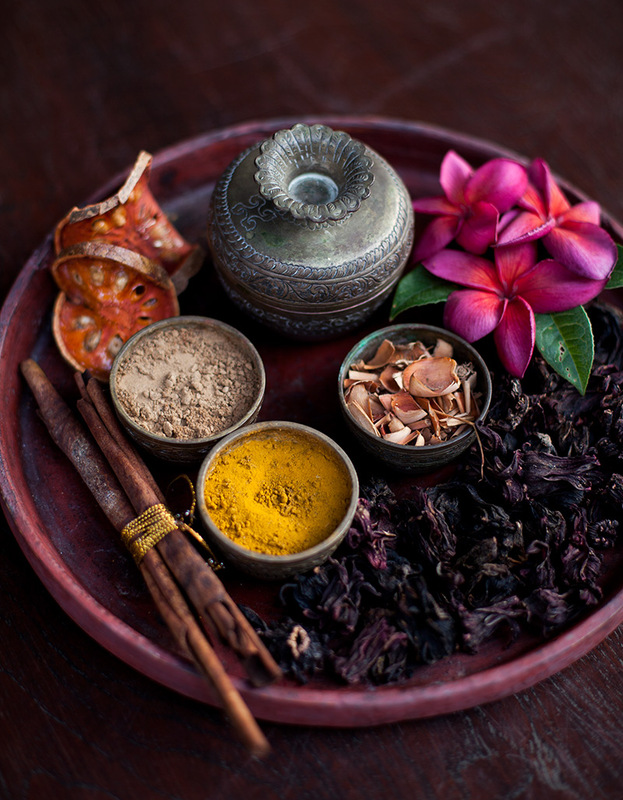 From full body massages, facials and scrubs, each experience is set in it's own villa and begins with herbal teas made from dried ginger, hibiscus flowers, herbs and honey. 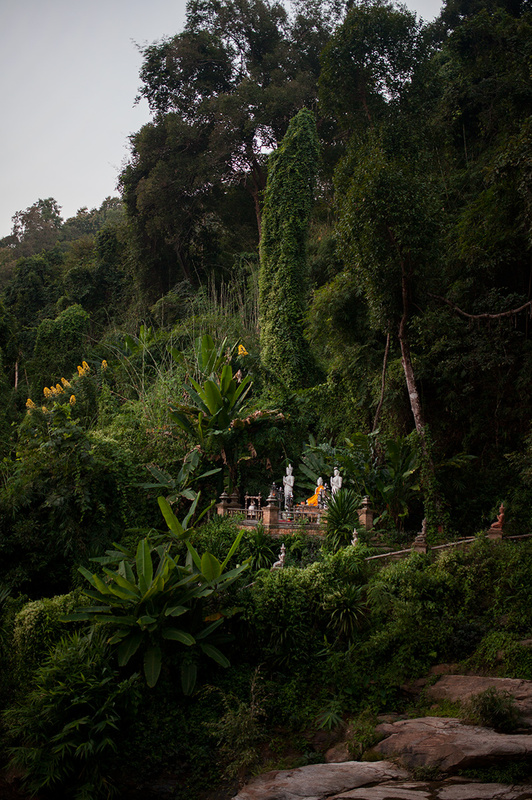 This temple about 30 minutes drive into the countryside East of Chiang Mai is the site of intricate golden spires, a gleaming temple and a giant white buddha. 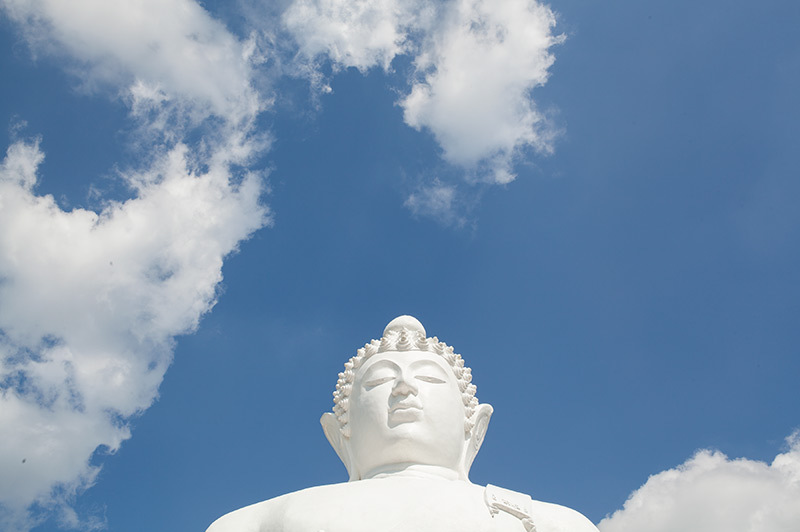 The Buddha, set against the blue sky and a few clouds, is positively celestial, radiating peace and thoughtful contemplation. This is an inspiring place, with nary a tourist in site. You'll need a local guide or driver to get here, as it's not connected by any public transport. 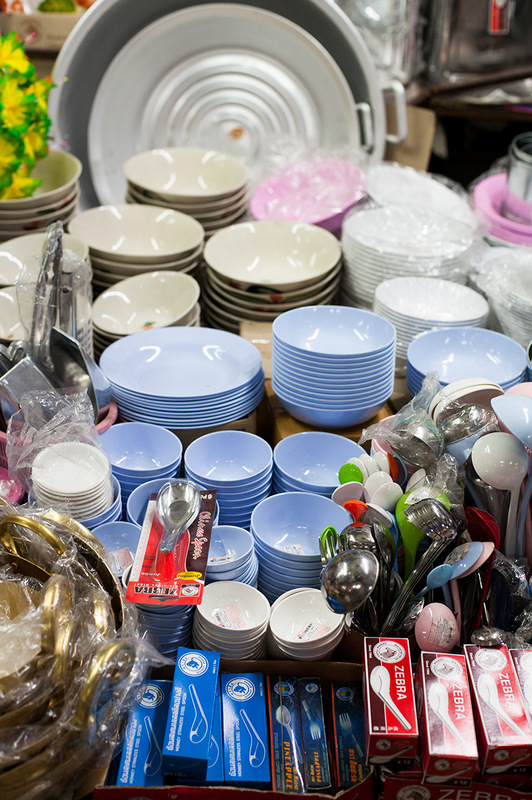 Housewares at the Warowat market. 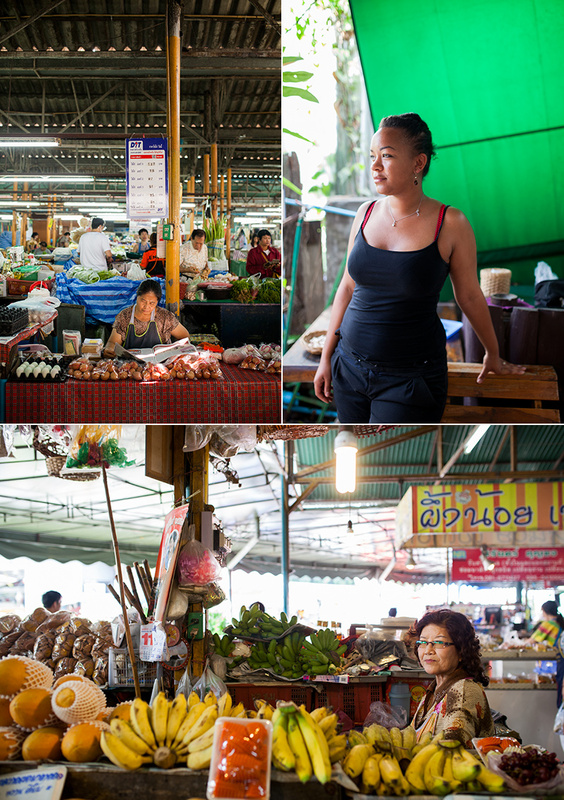 Chiang Mai is a shoppers paradise with many souvenir stuffed, touristic walking street affairs -- but this multilevel daily market is where the locals go to get regular stuff. 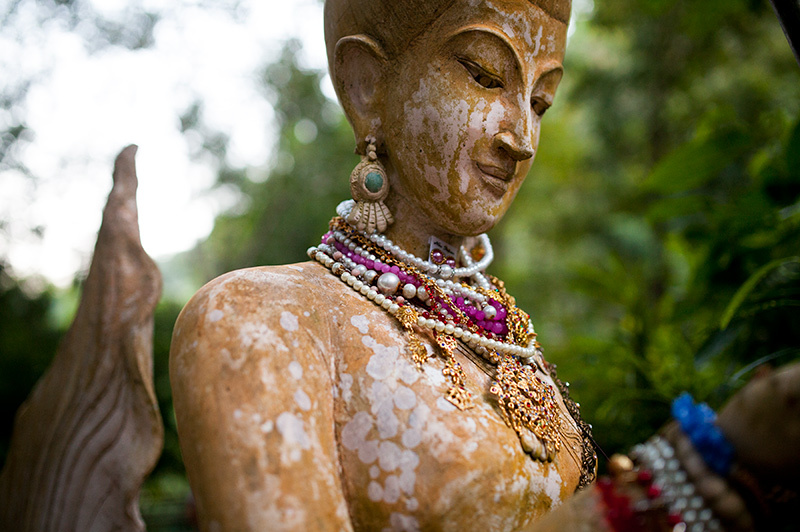 You'll find clothing, beauty products, temple paraphernalia and my favorite, the housewares. Plastic and enamel dishes in every shape and size, patterned and plain, in all in the signature pastel colors so ubiquitous in Northern Thai restaurants make this a must visit. Little spoons and tin lunch pails are available here too. Just prepare your suitcase for a picnic.